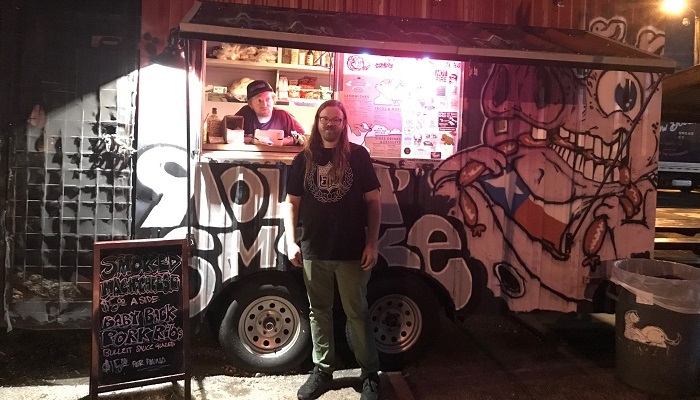 From the moment you see Rollin Smoke BBQ’s pink, spray-painted trailer at East 6th and Comal, you can tell they do things differently. With East Texas barbecue flavors and late night hours, Rollin Smoke does more than hold its own in a crowded field. Rollin Smoke owner Kyle Stallings has been carving out his barbecue niche since 2012. He worked hard to understand what it takes to offer quality products in a city with high standards. “I just absorbed all the information I could get from wherever I could get it,” he shared. Unintentionally, though perhaps symbolically, the trailer sits in the middle of an imaginary line between Franklin and La Barbecue. Ever-growing east Austin feels like the right place for up-and-coming Rollin Smoke. “We love it here; we wouldn’t want to go anywhere else. We’ll stay here as long as we can,” said Stallings. As it turns out, what they like is also what I like. I dug into the baby back pork ribs, the weekly special. The meat fell off the bone. It had a sweet and spicy combo so packed with flavor, I found barbecue sauce totally unnecessary. The baby back pork ribs, usually available on Fridays, are one of the many Rollin Smoke daily specials that keep Stallings and his team busy. For instance, there’s the dinosaur beef ribs on Saturdays and taco specials on Sundays. For a mouthwatering look at the truck’s various specials, follow them on Instagram. WARNING: Dangerous to see on an empty stomach. Briskets are smoked for an average of 11 hours in Rollin Smoke’s onsite smoker. When I tried some, it was as tender as I’d hoped. The unique, East Texas rub overwhelmed my pallet. I dipped each succulent bite into homemade barbecue sauces. The lighter sauce was Stalling’s Bulleit Bourbon (“my new baby,” as he calls it). Its strong and liquor-y taste stays true to the Rollin Smoke theme of original and delicious. The smoked mac-n-cheese used to be a special, but it’s almost always on the menu now. People want it, and I can see why. I also tried the jalapeño and cheddar sausage. It had a kick that reminded me to slow down and take a breath every once in a while. Delicious barbecue without the long line, late-night hours, and a flavor all its own. 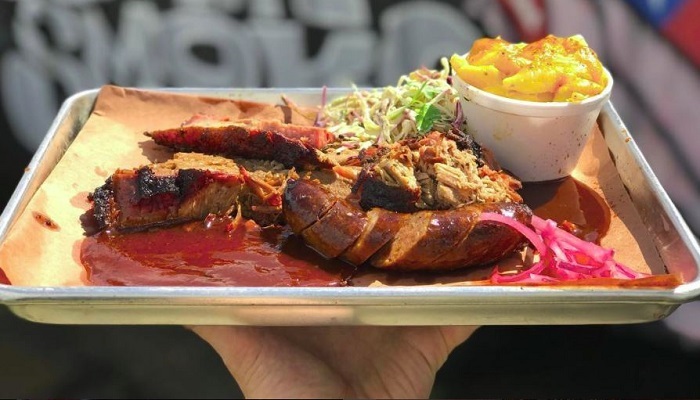 Rollin Smoke is right to welcome the competition that comes with serving barbecue in Austin. “It’s a good thing. It makes everybody better,” Stallings believes. In fact, the food truck may not be able to call itself an underdog much longer. For more information, visit Rollin Smoke’s Facebook page. Have you tried Rollin Smoke BBQ yet?